We drank more than 31 cups of lukewarm coffee in order to find the best mug warmers out there. We’re confident that you can’t go wrong with the Mr. Coffee warmer – an affordable, basic offering that does exactly what you want it to! Sometimes the climate just doesn’t agree with your morning cup of coffee. Or, maybe you like taking your time sipping down your morning cup of joe. Either way, you might end up with a lukewarm cup of coffee halfway through your drinking it – and there’s almost nothing worse than a room-temperature cup. Enter mug warmers. These are flat plate heaters that you can plug into either a wall socket or even a USB port. They’re simply designed to maintain your cup’s warmth for hours on end. Just think of them like a heated drink coaster that protects your table and keeps your coffee warm to boot! So let’s jump in and take a look at some of the best, most affordable mug heaters available today. After, we’ll take a more in-depth look at what constitutes a “good” mug warmer. All 5 of these warmers have been personally used and thoroughly tested by our team. Our prime considerations in compiling our top 5 shortlist were price, how long each unit kept a standard cup of coffee warm for, and overall construction/durability. Decent size and can accommodate almost all mug sizes and even small bowls. Can get hot enough to re-heat your mug. Does not work as good outdoors. Does not have an auto shut-off feature. The Mr. Coffee brand is quite known in this market as a manufacturer of the most affordable coffee machines in the market today. This mug warmer keeps the tradition alive with its extremely budget-friendly price tag. 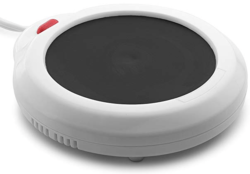 The Mr. Coffee mug warmer is large enough accommodate all types of mug sizes (3 ¼ inches in diameter) as well as small bowls for soup. The cord is around 67-inches long, more than enough to ensure that the hot plate can come wherever you are in the room. The temperature of the mug warmer reached a peak of 97C within 15 minutes. I would say this is not only a great way to keep your cup of coffee warm but also to heat it up it goes cold. The Mr. Coffee Mug Warmer is incredibly easy to use with a simple and basic control scheme. The surface of the plate is also easy to clean as it appears to be coated with a stain-resistant finish. If there is one complaint about the Mr. Coffee Mug Warmer is that it seems to experience some difficulty getting warm enough in extremely cold weather conditions. Of course, by extreme, I mean going down the double digits in the negative territory. You most likely won’t be living in such conditions so this is not much an issue. LCD display shows you the current temperature. Comes with an overcurrent protection feature. Can only maintain the temperature of the cup, won’t really reheat it. The COSORI Premium certainly looks the part of a modern mug warmer. The black and silver finish gives it a flair of sophistication while not being too ostentatious in design. When it comes to its output power, the COSORI manages to deliver solid numbers. The plate can heat your cup up to a max temperature of 131 F (55 C). It is not as high as the Mr. Coffee but this is a good number if you want to maintain the warmth of your coffee or any other beverage. It is made from high-quality and durable stainless-steel so you can expect this one to last quite a long time. This does not have an auto shutdown feature so you should be aware of this fact when it is not in use. 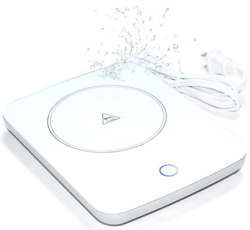 Cleaning is easy and the hot plate itself is dishwasher safe. I also won’t rely on this to heat your cup of coffee as it does not reach the proper temperature to do so. Can generate extremely high temperature reaching and going above 100C. The Quick-Cool technology quickly disperses the heat in a matter of minutes. The Bellemain Mug Warmer is another highly affordable yet reliable mug warmer to help keep your beverage hot. 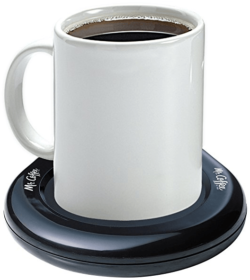 The hot plate surface has a diameter of 3.5 inches which is large enough to accommodate almost all mug sizes. I have clocked the temperature of the surface to average around 100C and managed to hit 108C at one point. This is hot enough not only to keep your cup of coffee warm but also to reheat it if gets cold. I also enjoyed its Quick-Cool technology that speeds up the heat dispersion once you turn it off. It has a non-slip base which should completely prevent it from sliding around the table or counter. Cleaning is also quite easy as it uses a non-stick finish. This is not only marketed as a mug warmer as you can also use it to heat up candles as well. 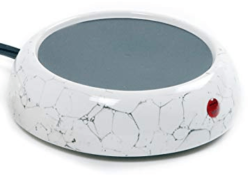 Hotplate surface may sometimes take a bit of time to reach maximum temperature. The NiceLucky Coffee Mug Warmer features a temperature control system which is a good feature to have. Basically, the heater senses when you put a mug on it and starts heating up. It starts cooling down as soon as you take the mug off of it, so you never need to worry about a power button or worry that you might have left it on. It reaches a maximum temperature of 55C which is hot enough to maintain the warmth in your cup but not enough to reheat it. This is one of the more compact mug warmers on this list making it a good choice for office desks. However, the hot plate is also not that large and might not be able to accommodate larger mugs. Check to see if your favorite mug can fit into the hot plate before purchasing this mug warmer. If you’re looking for the best coffee cup warmer with auto shut off, this is our recommendation. Compact design makes it easy to bring anywhere. Non-stick surface for quicker cleaning. The LED light that indicates whether the device is on is disappointingly dim. Especially in a well-lit room. Norpro is a long-standing name in this market and it has earned the distinction of being one of the most reliable mug warmers you can buy today. The compact design of the Norpro means you can use this not only at home but also in the office or if you are traveling. The cord measure in at 60-inches making it long enough to accompany you anywhere in a room. 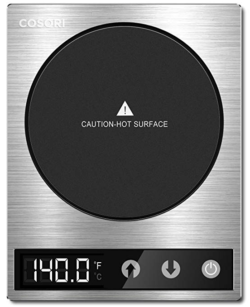 The hot plate surface measures in at 3.75 inches and can accommodate most coffee mug sizes. The surface is also quite easy to clean. Looking for a cordless, battery operated mug warmer? Unfortunately, we would highly recommend against buying a cordless or battery-operated warmer. There are very few attempts out there, and none of them generate enough heat to really keep your hot beverage warm. It’s slightly more inconvenient, but you’ll be much happier with a standard corded mug warmer like the ones on our top 5 list. What Makes A “Good” Mug Warmer? There are plenty of basic models out there that do their job well, but make sure you look into some of the more “premium” options as well – warmers that come with an auto shut off feature, warmers with larger heating plates, warmers that have an automatic temperature system, and so on. While these mug warmers will understandably be more expensive, these features can keep things easier and safer for you in the long run. Carefully check the list of features each product offers and see if anything stands out as being particularly helpful. How much are you willing to spend? There’s not a truly expensive tier of mug warmers, so it’s probably worth your spending a few bucks more on the “premium” models. Just to make sure you’re getting something that actually works, and that will hold up for more than a few months. You can never go wrong with an extra long corded mug warmer. This allows you to have more flexibility when it comes to positioning the plate. It’s all about convenience and comfort here. Having a mug warmer with a long cord means you can plug it into a wall and not have to worry about it not reaching your favorite sofa chair or coffee table. If you enjoy a cup of coffee or a cup of warm anything, having a mug warmer is a simple way to ensure it stays toasty even after some time. It’s one of those things you didn’t know you needed until you tried it out – then there’s no going back!